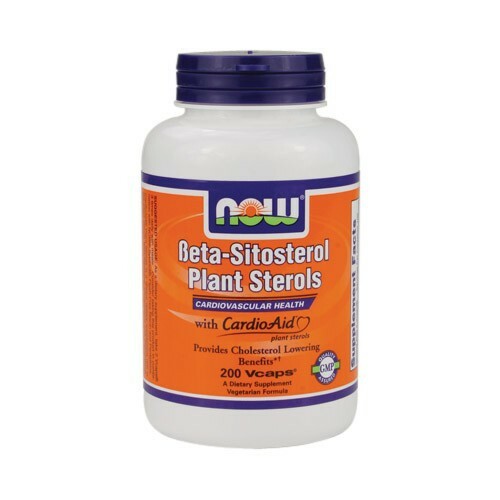 Now Beta-Sitosterol is very effective in controlling cholesterol levels. It has a similar structure as the cholesterol we receive through our diets. Are you tired of eating cheerios every morning just to keep your cholesterol level down? Do you wish there was a better way? Well there is. Now Beta-Sitosterol is very effective in controlling cholesterol levels. It has a similar structure as the cholesterol we receive through our diets. And what happens is that when you take Beta-Sitosterol it takes the place of the dietary cholesterol that we ingest. So when we ingest the dietary cholesterol the Beta-Sitosterol will signal to our bodies that we have enough cholesterol and therefore the excess cholesterol will be flushed out of our system. This will lead to lower cholesterol levels and lead to better heart health. So say good bye to your cheerios and say hello to NOW Beta-Sitosterol. Directions As a dietary supplement, take 2 Vcaps 3 times daily with meals. Consider taking this product in combination with NOW Sytrinol, Flush-Free Niacin and Pantethine.